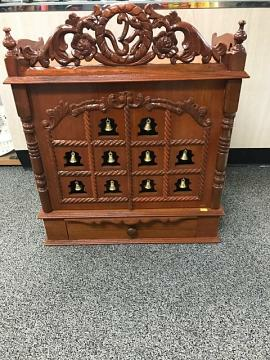 Traditional design wooden pooja mandir / temple for home. Has 2 doors with Bells in Light Brown color - 18". Setup your pooja room with this beautiful carved temple. It is also Ideal as a gift for house warming or wedding. Bell Type Wooden Mandir with doors in Light Brown color. The Mandir features a drawer and a pullout aarti plate, Wooden Base with Lacquer Polish. The mandir does have 2 hooks in the back for wall mounting. It does not come with any hardware. *In case of hanging on the wall, please make sure that the anchors in the wall can hold the weight of the mandir. Buy Light Brown Wooden Puja Mandir w/ Carving & Bells on Doors - 18, sold & shipped by Little India where you can shop online for Traditional Indian Gifts, Handicraft, Decor, Mandir & Murti. 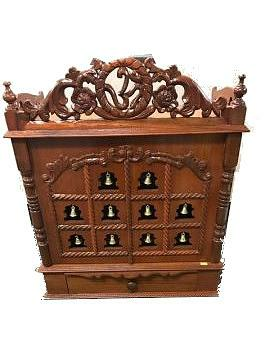 This Small Wooden Mandir collection has been tagged as Temple, Small Mandir, Hindu Altar, Puja Ghar, Wedding Housewarming Gift, Pooja Ghar For Home.